Our current Future Gardeners contributed to the opening of a new peace garden in Southwark created as a response to rising knife crime. Southwark has experienced among the highest incidents of knife crime of any borough in London – averaging two serious incidents a day. Local resident Abdulrahman Musa-Johnson was driven to combat this increasing violence after being attacked near his home in 2015. He gathered together a group of local residents, members of his church and representatives from the local police, Council and Anti Knife Crime Forum to see what could be done, from this meeting the concept of a Peace Garden was born. Opened on 21 September, World Peace Day, Southwark Peace Garden is the work of a huge group of local people and organisations. The garden is located at Walworth Methodist Church on the former ‘Clubland’ site. Our Future Gardeners populated the garden with plants provided by the Grow Wild outreach initiative of the Royal Botanical Garden of Kew. The garden also boasts a herbal area featuring medicinal plants donated by the Royal College of Physicians. Working on live projects like this one is an essential part of our Future Gardeners course. The course, which is completely free, is aimed at those who are long term unemployed, or who have faced some challenges in their life. 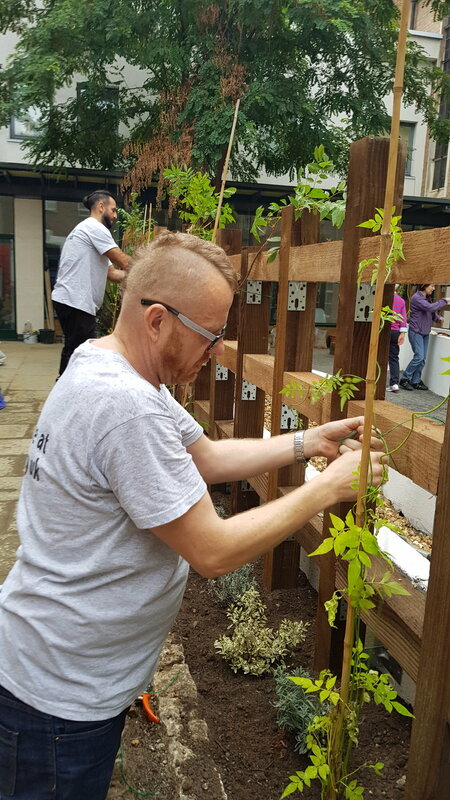 As well as practical, hands on gardening training, our students gain a qualification, undertake work experience and receive cv and recruitment advice with the aim of getting them work ready in 10 weeks. The Future Gardeners and Bankside Open Spaces Trust are proud to be part of Southwark Peace Garden and look forward to seeing it flourish.